A new 7-week term of weekly swimming lessons begins Monday to Sunday, April 29th–5th of May. Bookings are now open. Please see a full list of times below and please note that “Beginners” or “Improvers” means Beginner 1, 2, and 3 or Improvers 1, 2, & 3 at the same timeslot. For toddlers aged 3 and up. Develop water confidence & play games. For children ages 4 and up. Confident. Kicking on front and back with floats and putting faces in the water. Streamlined on front without floats. Confident on back without floats. Attempt arm action. Kicking on front with float. Push & Glide. Front crawl 10m. Back crawl attempting arms. Roll front to back. Floating on front & back. Front crawl with breathing 12m, Back crawl 12m, Attempt Breastroke, Pick up objects from the bottom of the pool. Front crawl ½ length with breathing, Back crawl ½ length, Breastroke, Butterfly Legs. Front crawl and Back crawl 20m, Breastroke 20m, Attempting butterfly, Attempting tumble. Front crawl, Back crawl, Breastroke, Butterfly 15m, Sculling. Rookies is an introduction to lifesaving skills. Keep up your swimming! Improve technique and build stamina through coached sets. Pre-school (Pre) lessons are suitable for children aged 3-4 years old. Lessons are 30 minutes in duration. This is an introduction to the pool and concentrates on building water confidence and basic swimming skills. Classes cost €48 for 7 weeks. Child lessons (Ch) are suitable for children aged 4 years and up. Classes are 45 minutes in duration – 35 minutes instruction and 10 minutes supervised playtime at a cost of €60 for 7 weeks. Rookies (Ch) is a 45-minute class consisting of theory, dry activities, and pool work. 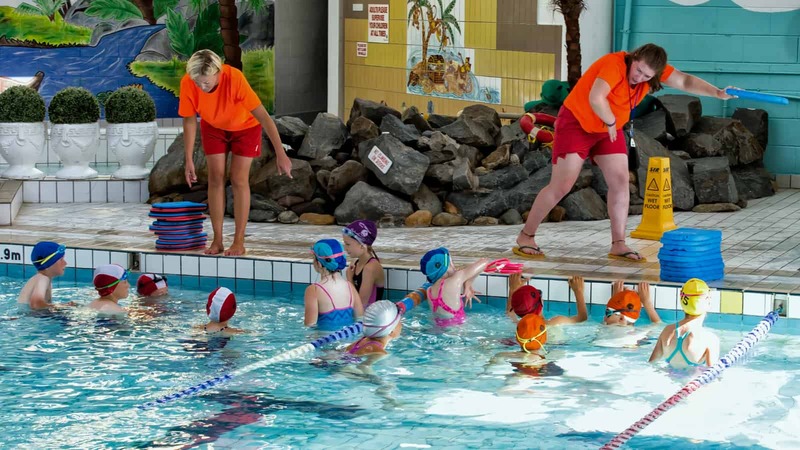 This is an introduction to lifesaving skills and is suitable for children of an advanced level. There are three grades: gold, silver, and bronze. Mondays: 5:10pm, Fridays: 4:30pm & Saturdays at 10 & 11am. Pro-Kids is a weekly training session for advanced kids to improve stamina, get stroke advice & learn some new swim skills. Cost is €40 for 7 weeks. Tuesdays at 6:45pm, Wednesdays at 5:15pm or 7pm. Late Starters (Ch) is suitable for children aged 9 and up including teens. This is a class exclusively for older kids and teens starting to learn how to swim and gaining water confidence in a group setting. Thursdays at 5:15pm. Cost is €60 for 7 weeks. Adult weekly swimming lessons are 45 minutes in duration and the cost is €65 for 7 weeks. Taught in a small group setting. Beginners, Mondays at 8pm. Improvers, Wednesdays at 8pm. Cost is €65 for 7 weeks. (Pre) (Ch) 1 Ch: €60 2 Ch: €114. 3 Ch: €160. 4 Ch: €207. 5Ch: €247. 1 Pre + 1 Ch: €102.50. 1 Pre + 2 Ch: €153. 1 Pre + 3 Ch: €202. 2 Pre: €92. Other rates are available upon request. What to bring? Just bring your togs, towel, hat & goggles: armbands are not required. All swimmers must shower before entering the swimming pool. Please lock away all belongings in the lockers provided. Unattended belongings may be removed from the cubicles. Parents, please stay off the pool deck. If absolutely necessary, we have shoe covers at reception, just ask. Please ensure that children are collected promptly after lessons.